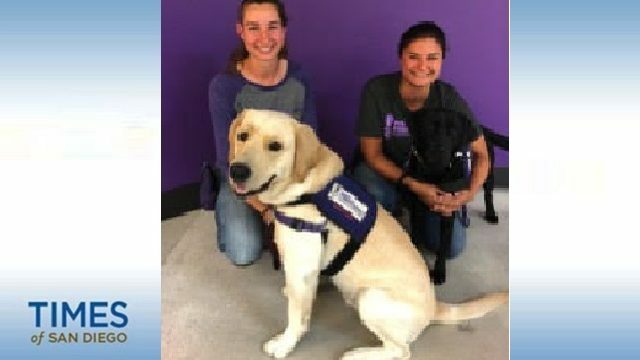 Injured veteran and active-duty military service members will soon be getting some added canine relief in San Diego with the grand opening of Paws for Purple Hearts. The nonprofit organization works to improve the lives of America’s military members facing mobility challenges and trauma-related conditions, such as post-traumatic stress disorder and traumatic brain injury, by providing service dogs and canine-assisted therapeutic programs. The new facility, located at 5550 Oberlin Drive, will officially open in a ceremony from 5-7 pm April 12 with a ribbon cutting, proclamations by the Mayor’s office, City Council, County Board of Supervisors, service dog demonstrations and facility tours, according to a statement from the organization. In addition to the new San Diego location, Paws for Purple Hearts currently conducts its “Canine-Assisted Warrior Therapy” in partnership with the VA San Diego Healthcare System at La Jolla, the VA Long Beach Healthcare System and the U.S. Marine Corps Wounded Warrior Battalion – West at Camp Pendleton, according to the organization. “Our new facility will allow us to increase the number of warriors served by providing flexible session location options to partners,” said Bonnie Bergin, co-founder of Paws for Purple Hearts. Paws for Purple Hearts began in 2006 as a research program at the Bergin University of Canine Studies, also founded by Bergin, with the Menlo Park Veterans Administration Medical Center, according to the organization. “We provide life-changing Canine-Assisted Warrior Therapy to dozens of Southern California area veterans and active-duty service members, reducing their PTSD and TBI symptoms and enabling them to reengage more fully with their families, friends and colleagues as productive members of the community,” said Bergin.